If you have just joined me - WELCOME - I completed the KonMari method with my OWN belongings last year, you can read 'My KonMari Journey' to see how I did. Now, it's time to get stuck into my kid's stuff - I have two children: Miss B, 12 years old and Master M, 3 years old. 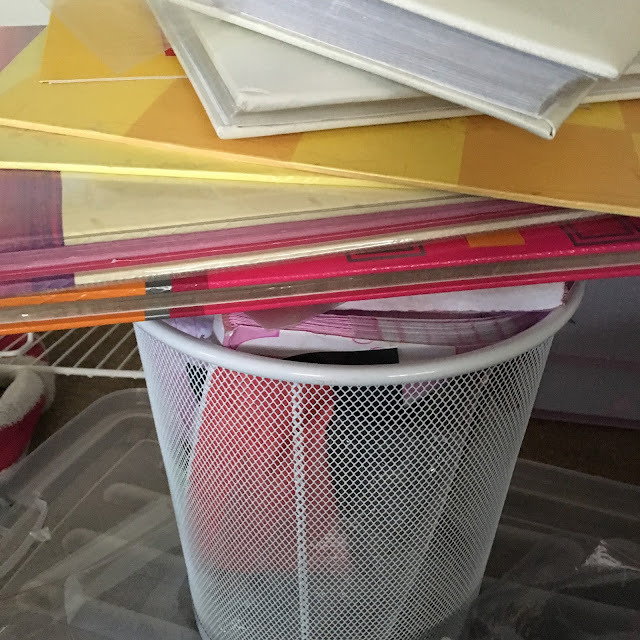 Previously on the blog, I shared how I KonMari'd my kids clothes (Baby, Toddler and Tween), their books, Paper - including Art Work and School Memorabilia, TOYS, DVDs, Crafts, Stationery & Bedroom decor, Sentimental Keepsakes, and now it's time for the last sub-category: PHOTOS. I am so happy to be finally sharing with you, the final subcategory of Sentimental. 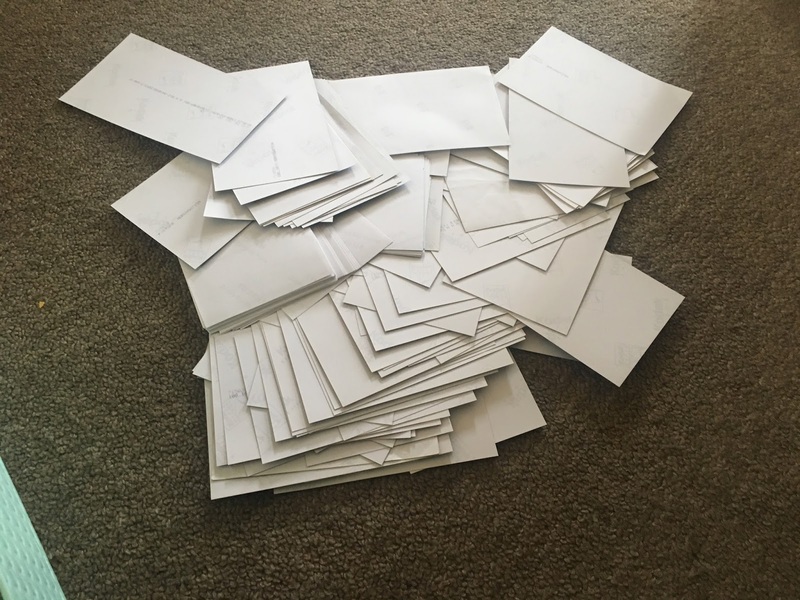 It's been a full on couple of months, and I haven't had a chance to blog until now! 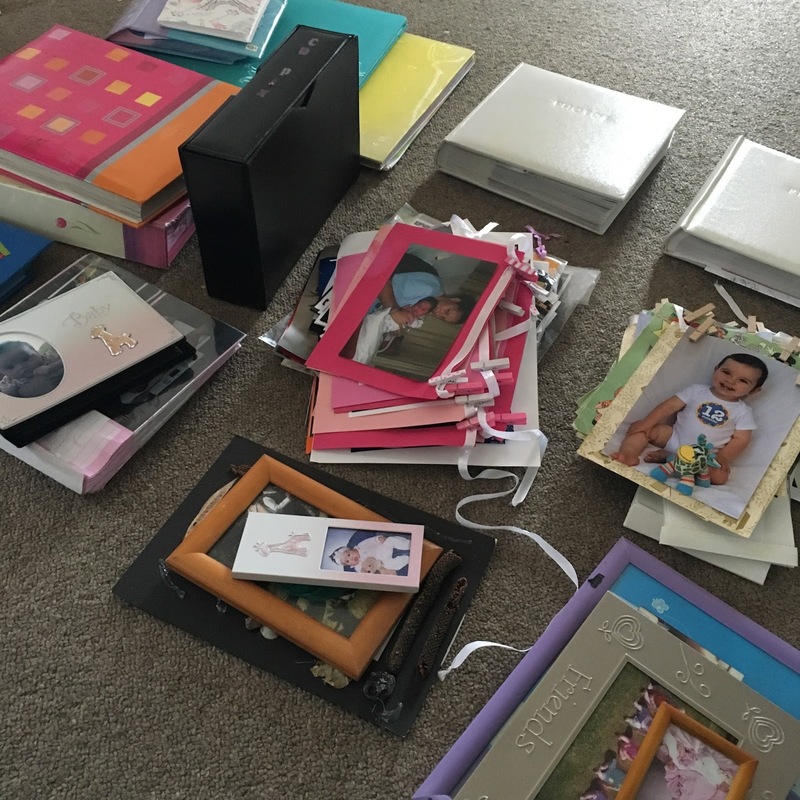 A few weeks ago I pulled out the 60L container of Kids photo albums and printed photos into the lounge and got stuck in. Note: I completed this task over two days, simply because it was huge task, there were A LOT of photos to get through. Here's what happened. 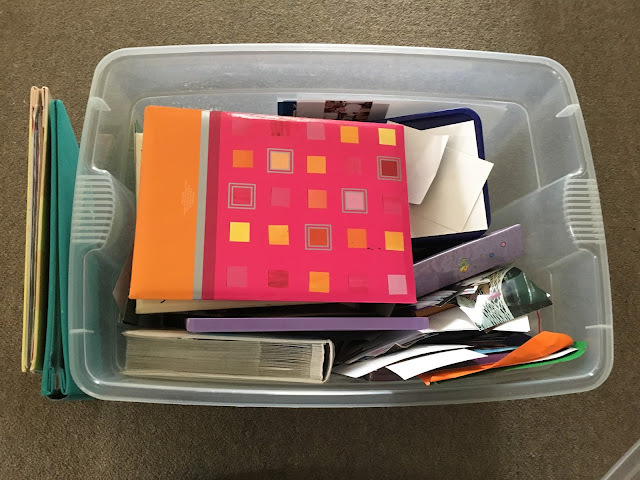 In this container, I had albums, printed photos, photos in frames, scrapbooks and a few other random photos. During my 'KonMari With Kids' series, if I found any photos, I would put them in this container. It filled up pretty quickly. 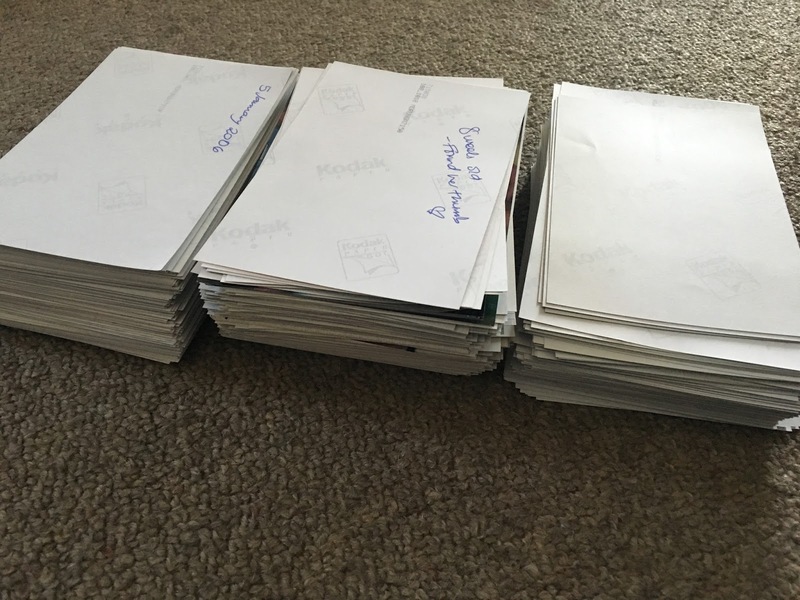 I took everything out and started to corral like things together and separated piles for each of my children (aged 12 and 3). This didn't take long at all. Marie mentions in her book, Spark Joy, "the basic rule is to remove all photos from their albums...but you don't need to do this for any albums that spark joy as a whole" - unfortunately for me, none of the albums sparked joy, they were old, torn (well-loved) and sun-faded. So I started removing ALL the photos from the albums, and I even found a few old school Kodak photo envelopes with photos in. I noticed I must have printed almost every single photo of my daughter when she was born, as I had two x 200 leaf albums FULL of just her first 2 months! 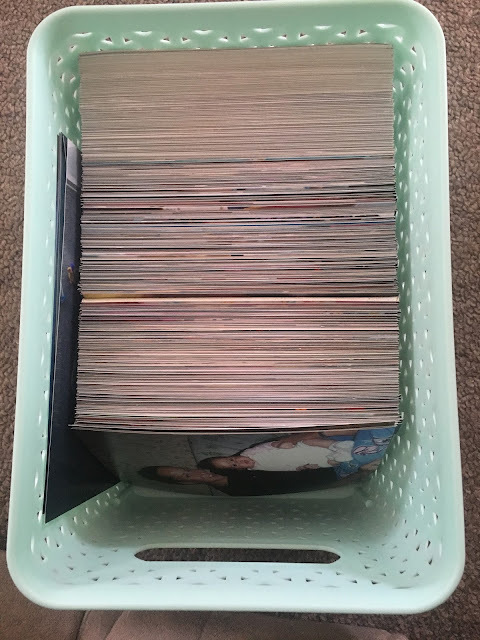 and one album from 3 months to a year, then there were random printed photos from throughout the years. My son doesn't have many printed photos, so his photos didn't take as long. 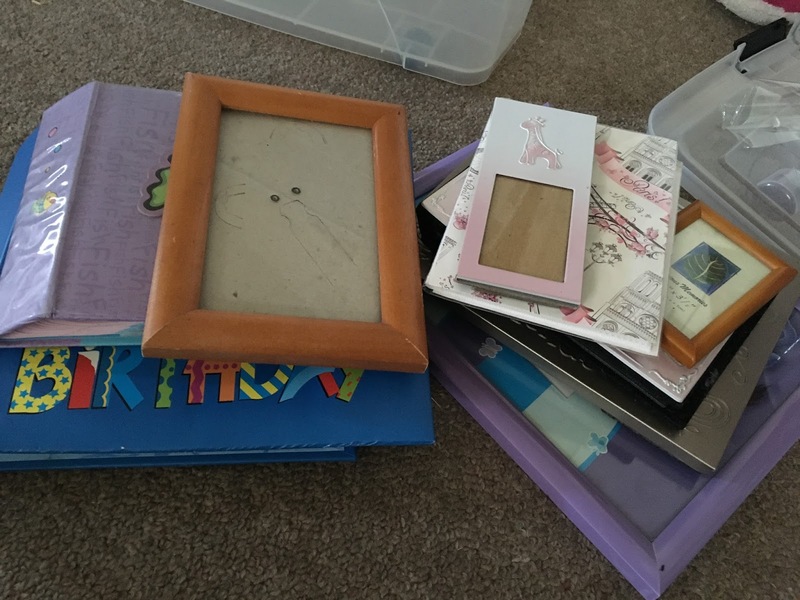 Frames and albums emptied and ready to be donated. Once I had removed ALL the photos from the albums, I was left with hundreds, possibly thousands of printed photos...now it was time to start the purging process - only selecting photos that spark joy. At this stage, I had to stop...I was so overwhelmed with the amount of photos, I decided to stop and start the purging process another day...looking back, I am really glad I did, because I wasn't 100% ready, and that is totally understandable. I believe it is really important for you to be ready and committed when tackling such a huge task/category. You need to be in the right head space, and for me, I wasn't. Take the time to re-evaluate your KonMari goals and what your vision is. This really helped me! After a couple of days, I returned to the photos. I had them temporarily stored in these small rattan baskets. The black box/folder is in fact an album with Photo CDs...I will be doing these separately, as it's a part of my next project, I have yet to decide if I will blog about it...watch this space. 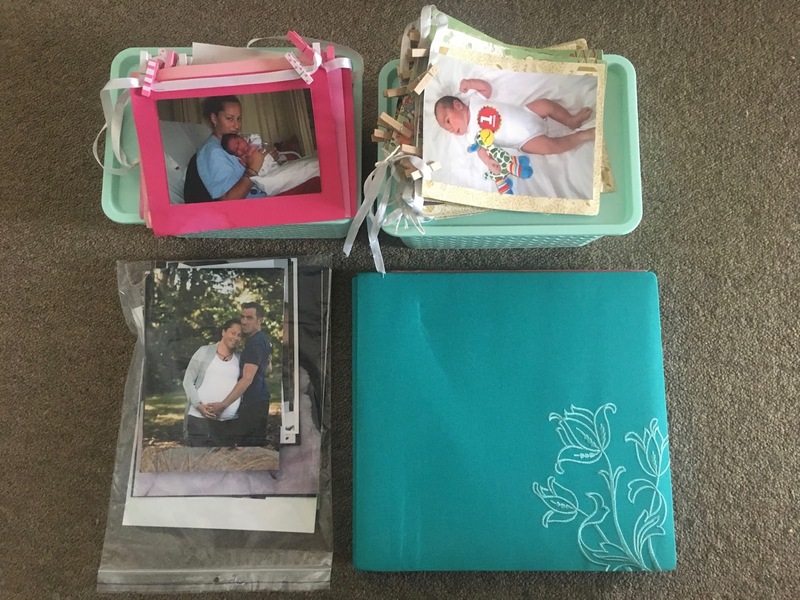 The rattan basket on the left are photos of my daughter (12 years old) and the one of the right are photos of my son (3 years old) - half of those are actually photos of my daughter EEK! The photos in the white basket (top right) are the kids 10th birthday and 1st birthday Photo bunting...these will be put in their keepsake boxes. The pile of photos behind them are our family photos and have been moved to my Photo box. I started going through my daughters photos, corralling like photos together, and found in amongst them were family photos, my personal photos (e.g. friends weddings that we both attended etc) and a few of my son, which were added to his pile. I was happy to find all of my daughter's school photos - now I can add these to her School Memorabilia folders. 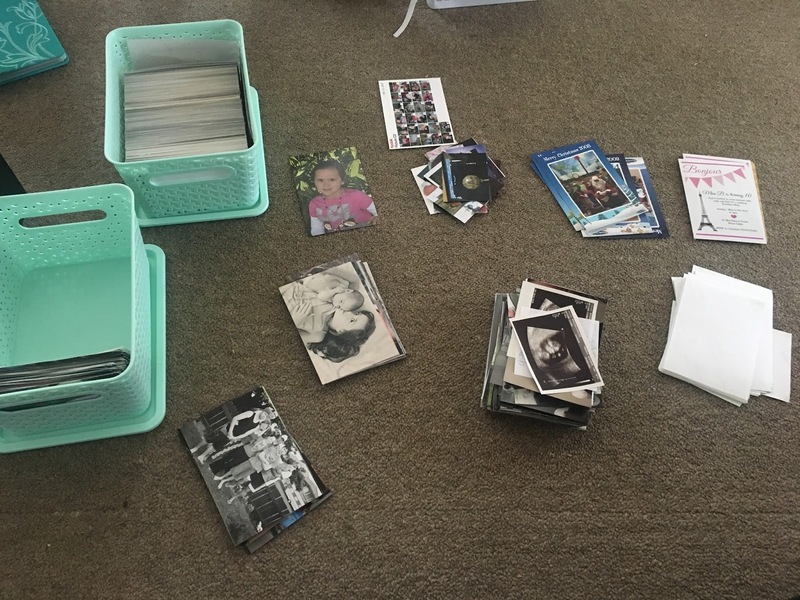 Now it may not look like much of a difference but I did purge over a third of my daughter's photos (remember she had a basket and a half worth of photos). I think when I start putting them into albums, I will probably find myself purging some more, and that is all part of reaching the 'click point' of what sparks joy and what I am happy with. I can't wait to get started. Photos & albums that no longer spark joy were discarded straight away. 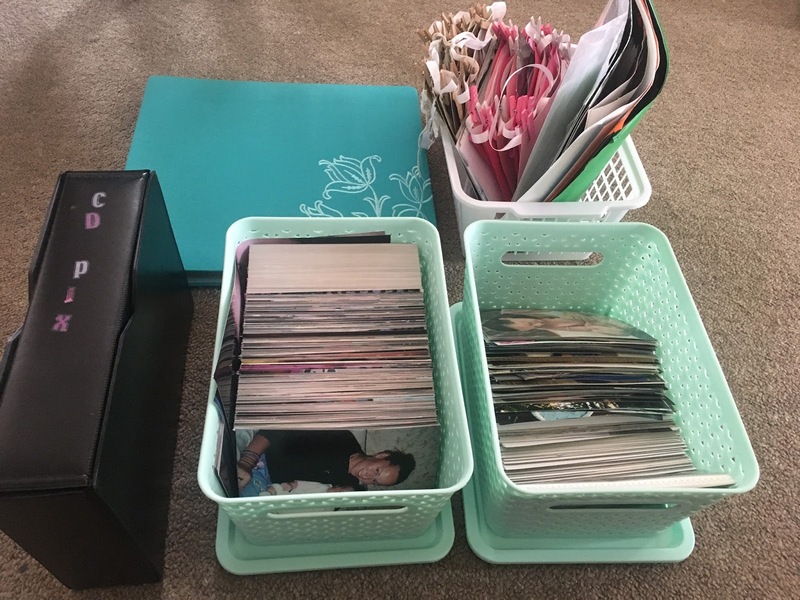 This is my temporary storage solution for my kids photos...each child has a rattan basket with their printed photos, their birthday bunting will go into their keepsake boxes, as well as my daughter's scrapbook. 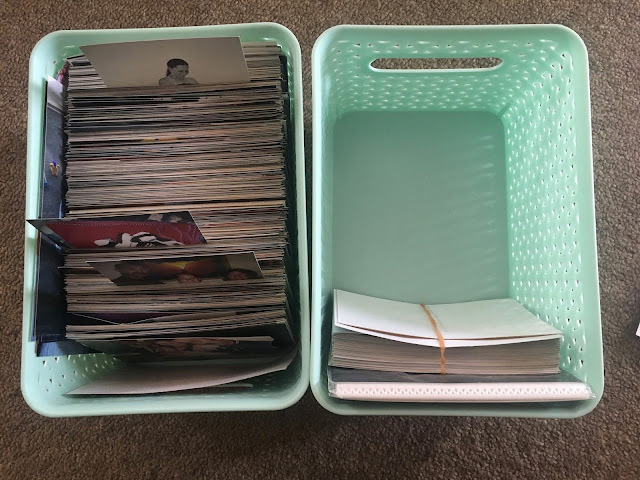 The photos in the zip lock back (pictured bottom left) are larger family photos and these will be stored with the rest of our family photos (See My KonMari Journey - Photos). It is such a relief to have all the kids photos in ONE PLACE and not in random albums that don't spark joy. Now they are ready to be organised and displayed. 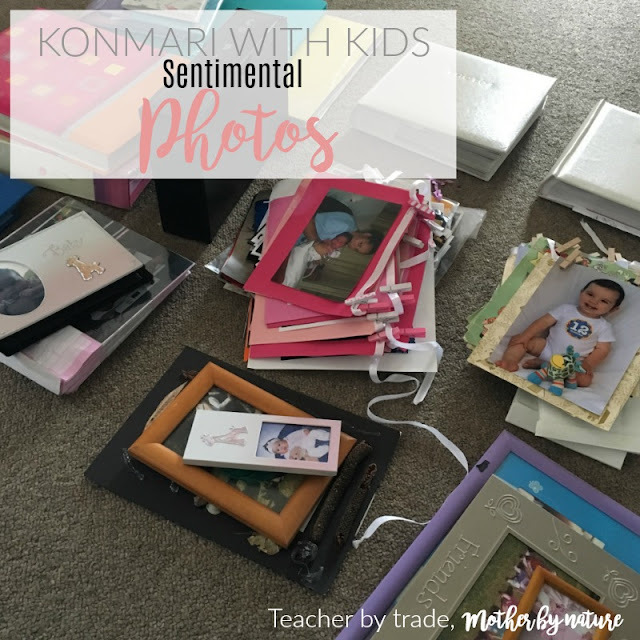 Now that I have completed the 'purging/discarding' part of Sentimental Kids Photos, I have been thinking about how I want to organise and store them, so that everyone gets to view the joy sparking photos. Before I began this sub-category, I asked my daughter (in regards to photos of her)..."In 10 years time, what would prefer to look at...printed photos (in albums) or a photo book?" 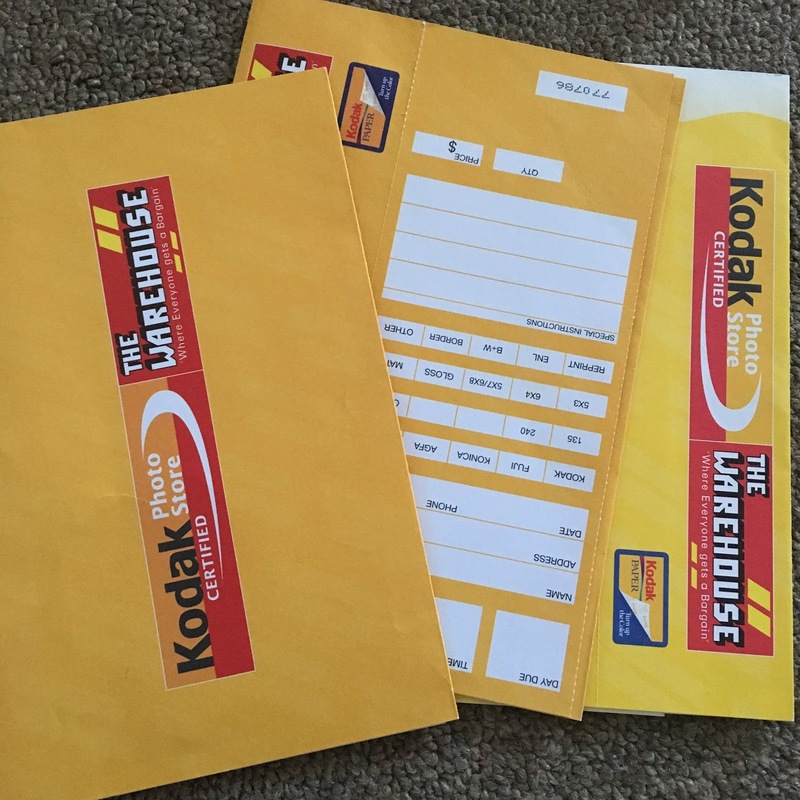 and she replied "printed photos"...this made me so happy because I do love printed photos and in 10 years time, who knows, the way things are evolving, there might not be printed photos, so we will treasure them until that happens. 'joy sparking' albums and add to them as my kids grow older"
My next goal, well an ongoing goal, is to get photos of the kids printed and put into their albums and get them up to date...SnapFish currently offer FREE 50 x 6x4 prints each month, so I am going to take advantage of that, and when I can I will print more photos. It's an investment for my children, and I know they will appreciate looking back at all these photos in years to come. I will also do the same for my personal photos and my partners, so we will all have 1-2 albums each. I think for our family photos - I will create 'Yearly photo books' dating back to 2014, when we became a family of four. I already have 2013 printed, so that's a start, right? 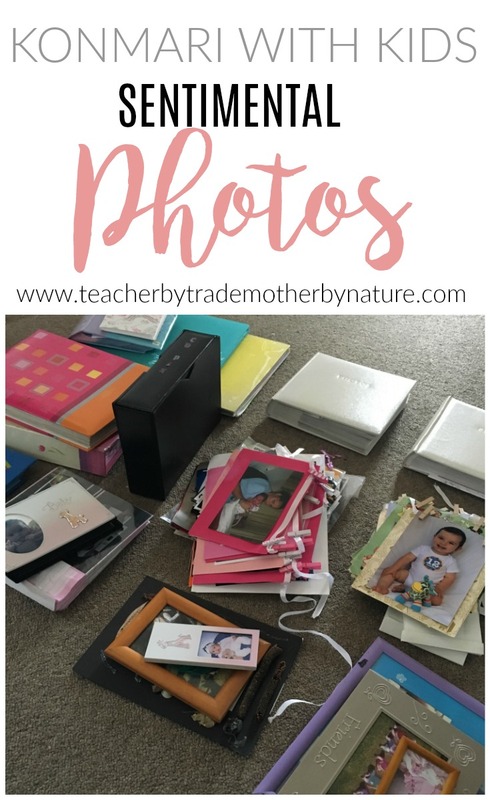 There are so many options out there at the moment, and it can be quite overwhelming, however, now I have a vision of what I want for my family, I am determined to get my photos off my devices and into books (whether they are printed albums or photo books. I am excited about my next project, it's a big one, one that won't happen overnight so watch this space. And that my friends, brings us to the end of my 'KonMari With Kids' series...I hope you have enjoyed reading about our journey, and that it has inspired you to give the Konmari method a go for yourself. If you have any questions, please don't hesitate to contact me, I am more than happy to help. Oh gosh this post is all too familiar with me at the moment! I'm 3 weeks away from having baby 3 and am frantically sorting through photos of my sons to get on top of it before I pop. I found it hard deciding how to arrange things; I decided ( after scrolling though all your posts) on a few systems...a baby scrap book album for each child ( pregnancy, birth-1 year) then the rest of their photos/ extras in another album each. Then I've gone ahead and put together our yearly family albums, well, I've started with this year and will work backwards..this year I've done it scrap book style but next year I think I will do it all digital and put together a page a month and print one book at the end of each year..it's just so time and resource consuming with all the little details in scrapbooking..I've also implemented the suspension file boxes and folders for that extra stuff for each child too. Gosh sorry that was a bit of a novel!